For those of you who don’t know, I am a scientist. No really. I have a psychology degree with an emphasis on research. This means that I conduct research on the human psyche and condition. This type of research relies on scientific methods that include setting all bias aside in order to see the real picture. 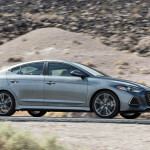 I mention this because I was forced to set aside any sort of bias I might have had for a recent week when Hyundai sent me the new Elantra Sport for a week. It came on the day BMW took back the 760i M version I had the previous week. It was the opposite side of the scale. The BMW is on the upper end, $170,000 of pure power and luxury. A 601-horsepower rocket ship that explodes off the line, while the seat massager preforms its magic. The Hyundai Elantra is on the other end. 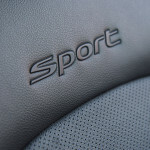 For the price of a few of the options on the BMW you can have an entire car with a “Sport” designation. The real-world beckons however. 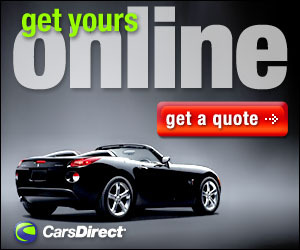 Truth is few of us could every afford $170,000 sedan. It’s left to Hyundai then to give us average folk a choice. At least it’s not an SUV or crossover. 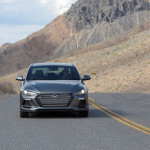 In a world filled with all manner of SUVs and crossovers, the offerings in affordable sedans seem to be getting less and less every year. 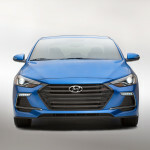 And it wasn’t all that long ago that Hyundai wasn’t even a player in the sedan market; quality issues plagued the Korean automaker; and cheap gimmicky cars were the mainstay. 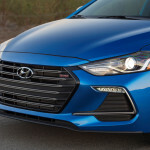 Today however, those issues have been solved, and Hyundai offers vehicles that are affordable, decently made, and have a warranty that is the longest in the history of mankind covering you for several generations. Okay not really but it is the longest in the industry. I’ve always generally liked the Hyundai. 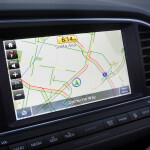 Of all the ones I’ve tested however, the Elantra makes the most sense to me. 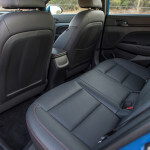 The small four door sedan certainly isn’t fancy, nor is it oozing with luxury, but it’s comfortable and has enough features to make it a nice, affordable, vehicle for a couple or small family. 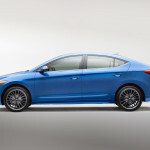 Well the Elantra Sport sort of looks that way. 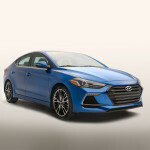 The “Sport” trim of the Elantra lineup puts high performance tires on 18-inch alloy wheels, lower side skirts, horizontal LED daytime running lights, dual exhaust tips, and a more aggressive front fascia. 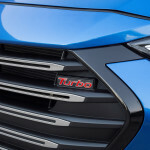 Under the hood the 4-cylinder puts out 201 hp at 6,000 rpm and 195 lb-ft of torque at 1,500–4,500 rpm as opposed to the 147 hp and 132 lb-ft torque of the rest of the lineup. My tester for the week had the seven-speed dual-clutch automatic transmission with paddle shifters, a 6-speed manual is available. 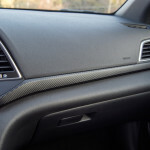 If you are remotely interested in the Elantra Sport, you better like black. That’s the color of the standard interior; the leather seats are bolstered with “Sport” embroidered on them; there’s also a black headliner, side panels, dashboard and just about everywhere it seems. 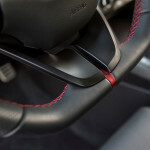 The only hints of color in the interior are red stitching and the needles in the sport instrument cluster. The steering wheel is flat bottom and has controls for the cruise control and the audio system; my tester had the Premium package with navigation and an upgraded 8-inch screen in the center console. This is a small sedan and the interior reflects that; it isn’t roomy, but not uncomfortably claustrophobic. On the road, sort of. The standard rear torsion beam suspension has been replaced with a multi-link independent one, so in theory the Sport should be able to handle more aggressive driving. But sadly, on the road, the elements of sport that should be there, seem to be missing. Perhaps it was my leftover bias from the BMW, but the power of the Hyundai, while adequate, seems a bit short of anything sporty. 0-60 in 7 seconds isn’t all that impressive; and the lack of any real exhaust growl is something that had me wondering: Where’s the Sport? 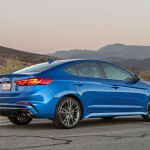 There is a sport mode that seems to make the steering a bit heavier and the shifting a bit crisper, but beyond that the Elantra Sport seems to fall short of say a Golf or Focus RS. For the price, the Elantra is a good car. I had a Limited last year, and liked it, liked it very much. It’s a sedan in a world of SUVs and crossovers; a rarer and rarer thing. If I was looking for a decent small sedan the Elantra would be on my list. 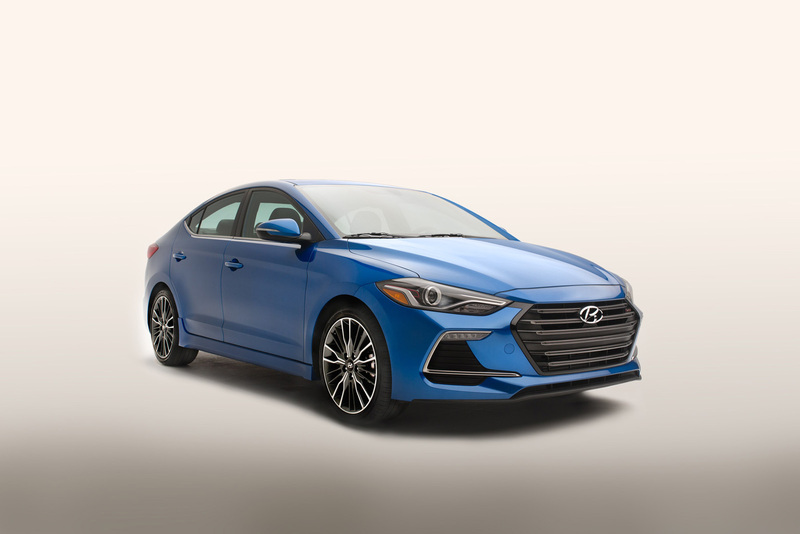 Maybe my bias clouded my judgment, but if I was looking for a small sporty sedan, I’m not quite sure the Elantra Sport would be on my list. If a bit more sport was added, a throatier growl, a quicker launch, a bit more aggressive tuning, then it would be. 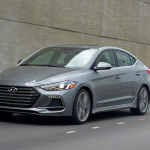 For 2018 however, Hyundai is leaving the Elantra Sport alone. After all this 2017 model marks the introduction of the sixth generation. 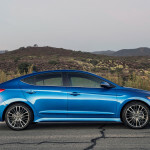 They are adding a new Elantra to the lineup though; the GT, sigh, a new crossover. EPA passenger volume 95.8 cubic ft.
EPA cargo (trunk) volume 14.4 cubic ft.
EPA total volume 110.2 cubic ft.